Confession time: back in my omni days, I was totally one of those “ranch girls”. You know the type – hell, you may even be the type. (no shame!) Ranch on french fries. Ranch with pizza. Have you ever had a grilled cheese and tomato sandwich dipped in ranch? Yeah, just sayin’ . . . So obviously, all these things can be veganized very easily. And for a while that’s just exactly what I did. But over time, as I moved away from processed products and transitioned to a primarily whole foods diet, I sort of left the ranch behind. And for a long time I just did without. I ate my raw veggies with hummus like a good vegan (ha! ), but I never replaced that cravable, always-applicable, easy “go-to” dip. Tahini. Dear, sweet, slightly bitter but oh-so-delectable, nutrient-rich and totally unique, tahini from the heavens. I heart thee! Tahini has filled the void where ranch once resided. Tahini, with its tang and bite, with its high protein and exceptional calcium count, with the sort of ubiquitous zest that will accompany any flavor profile. Tahini is like the “jeans” of the food world! And this dip, just a little bit different every time I make it (which is why it’s so dang wonderful), is the “perfect pair”. It goes. with. everything. I slather it on raw crackers. 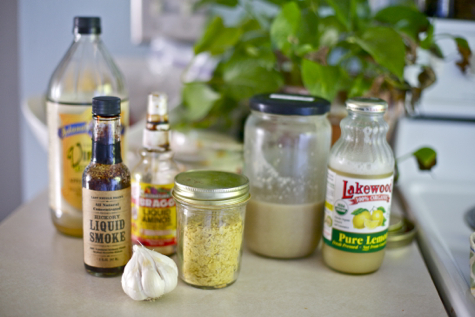 I use it as a salad dressing. I pour it over roasted root veggies and baked potatoes. It’s a great for dunking sandwiches and it’s equally divine as a mayo replacer/bread spread. 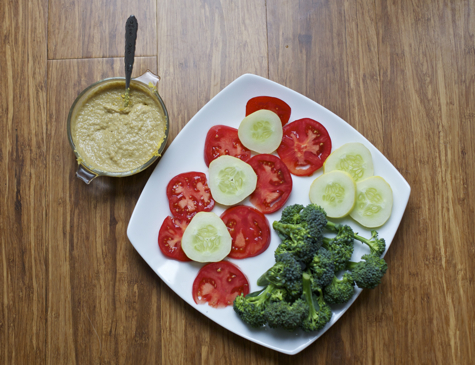 And of course, it’s my ultimate, go-to raw veggie dip. The following recipe is written in approximations, because that’s how I roll with it. That’s why it’s fun! You can work with what you have on hand and you can adjust to suit your tastes. Get creative with it and play around! Place all ingredients in a food processor or blender. Blend! Add water to thin to desired consistency (runnier for dressing, thicker for dip) (also, it will thicken up some after being refrigerated). This will store for up to two weeks in the fridge. I love savory dips! This looks delicious and that pic of your little one is adorable! Ooh. I bet chipotle spices would be good in this too. For dipping yam fries? Yes, please! this sounds great! i love tahini sauces. before any of the good vegan cheeze or nut cheeze recipes came out, i had a cookbook that made something like this. you pour it on top of casseroles and bake it on top, it forms a cheeze crust too! Yum! It’s only 9am here but this sauce has me wishing it was lunch time so I could make it and have it on a salad. waits is KILLING me here. a little water or coconut milk just to liquefy it. I consider unfair that you tempt us with a totally cute pic of Waits. I mean, you had me wanting to do this recipe before I even read the ingredients. BTW tahini is difficult to come by in my town. Is it difficult to make my own? oh yum! i’m always looking for non-processed alternatives to my condiments! what a great idea. also Waits is adorable. Oh yeah…another tahini fanatic! I always have to have some laying around and it’s a must for all of my salads. Omnomnom. I eat tahini dip a lot (I buy tahini in 8lb buckets from a little middle eastern grocery), but I tend to be lazy and just make mine outta lemon juice, tahini, and water to thin. Sometimes I add some garlic. I’ll have to try your variations! Despite putting nooch on my popcorn for a while, I have yet to really discover it’s true awesomeness till recently when you said it’s in your standard salad dressing. Boy did that open my eyes. Now I’m looking for more ways to use it. Yesterday I made herbed nooch biscuits for dinner. And my grandparents even commented on how good they were! Looking forward to trying this now too! It’s reasonably easy, using either a grinder or a mortar and pestle (I use the latter), grind up 1 cup of sesame seeds, slowly incorporating 1/4 cup oil (sesame is obvious, but it’s expensive and you can use a combination). Toasting the sesame seeds before hand adds a nice flavour, and you can toast them in a dry frying pan or in the oven, keep a close eye on it though, they brown very quickly. When I spent some time in a forest blockade in Tasmania, I came up with something similar this to go with a ‘kinda-sorta’ Caesar salad after getting a donation of lettuce and assorted veg from local farmers and having 50% of the food tent full of stale bread (for croutons). All communal meals were made vegan, so it was pretty damn useful, that and the fact that any sort of non-vegan product would not have kept. It was a welcome alternative to the usual fire-cooked smooshy lentils/beans known as “hippy slop”. Oh also, if you roast a whole bulb of garlic (skins on, full thing intact) and then let it cool and squeeze out all the roasty-smokey garlic smoosh and mix it with tahini and a little lemon, it’s a super dooper anti-pasto dip. Ohhhh. And tahini with a drizzle of molassas tastes like halva. Last ‘ohhh, and…’, promise! Isn’t that pretty much a hummous recipe but without the chickpeas? My fave hummous recipe is from La Dolce Vegan and it’s practically identical to what you’ve posted. SO DELICIOUS. I love the pictures you post of your little guy loving veggies!!! 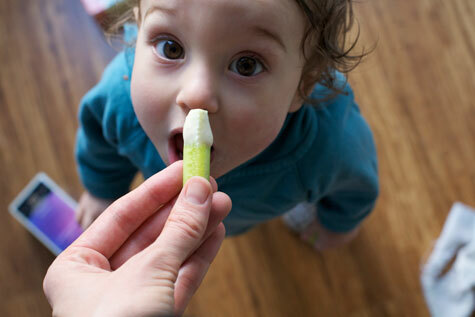 It is so great to see that even when kids are very young they can like/love veggies. It’s so sad that some kids I’ve seen on TV shows lately who don’t even know what the names of fruits and veggies are! Keep up the great job, mom, with raising your little one!!!! Tahini 101- what is the best way to make the tahini from raw organic sesame seeds? Soak the seeds??? Oil, to add or not to add? This simple task seems to be avoiding me. I have sesame seeds in my fridge for about 2 weeks, they are getting lonely. Please enlighten me!!! I live for tahini but am currently using TJʻs brand which honestly I do not really trust……..Blend or food processor or mortar and pestle??????? Also, tahini can taste a bit too bitter for me (particularly the raw tahini) but I think the other flavors of this would blend together nicely (and hide some of that bitterness). Tahini on its own? Not for me. I tried making a tahini nutella…blech! 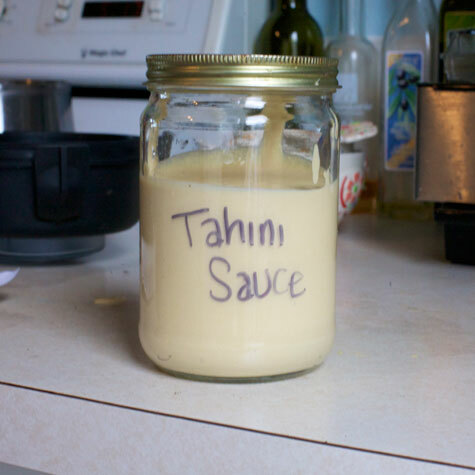 Looking forward to “borrowing” some tahini from a friend and trying this soon! Would you post your hummus recipe? Sounds good! This dip sounds quick and yummy! I think I am going to add fresh parsley or green onion when I try it. 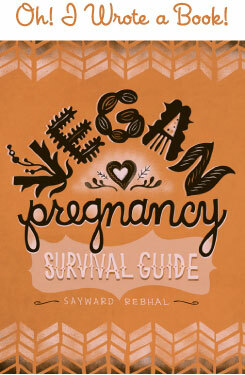 Thanks for (finally) sharing, Sayward! That’s awesome! The caramelized onions sound sort of genius, I adore caramelized onions . . . ooh, or leeks! I think I’m going to try caramelized leeks! I made some just after posting this, in fact! It’s the exact same process as homemade nut butter, but since the sesame seeds are so small, it just takes a lot longer. Like, a good 10-15 minutes of whirring before they really soften up and release their oils. But it’s worth it, because the homemade stuff is – of course – so much better! (and better for you since you can use unhulled seeds, most stuff is made with hulled seeds and that removes a lot of the calcium). I guess it’s close, but I’ve never seen hummus with nutritional yeast or soy sauce. Either way, it sure is good! I’d love to hear that recipe too! In plastic bags in the crisper, except my crispers are usually overflowing so sort of stuffed in plastic bags all over the place! =) I don’t use any of those fancy “preserve freshness” bags, though I’m told they work. Green onion is great, I’ve done that! Parsley sounds awesome too – very ranch-y! I am looking forward to your new book projects! I know…isn’t teasing someone with a delish-sounding recipe so cruel?? I actually get such compliments on it (along with my vegan, oil-free, nut-free, gluten-free dog biscuits..that humans end up eating! Ha ha) that I have been encouraged to try and sell it somehow. Now if I just wasn’t a wuss when it came to marketing! A tip for greens that works WONDERS for me (particularly with spring mix lettuces..or all lettuces for that matter, spinach, etc.) is to add a paper towel to the container/bag of greens. I usually like to put it at the bottom and then toss the greens in—trying to get the towel around as much of the greens as I can. Hope this helps! Too many delicious veggies had gone to waste before I discovered this trick! Someone at a raw-luck I went too kept insisting that tahini had oil in it. However, my best friend from childhood is Middle Eastern, as are some my cousins (although you wouldn’t know it by looking at me! I’m so typical caucasian it’s laughable—especially with my Middle Eastern and Filipino cousins!). And I know, for a fact, that traditional tahini is simply sesame seeds. Nothing else. Nada. I almost always put soy sauce in my hummus, and have been known to sneak some nootch in too! Sayward! Thank you. This sauce is amazing. I can’t wait to check out more of your recipes. JUST finished making this…THE BEST THING EVER……. Another BA success in my kitchen!!! Wanted to let you know that when I met you a few weeks ago at Peopleʻs Market (I was visiting my grandbaby) I was blown away. To me it was equal to seeing a celebrity and I almost did not have the nerve to say hi!! Glad I did, you are awesome. That was a “moment” for me!!!! BTW, my husband and son have a big crush on you… you are gorgeous!!! Oh my gosh Leslie, I was just thinking about you this morning! I had wanted to email you after we met, but couldn’t find your email.